A vortex street around a cylinder. This can occur around cylinders and spheres, for any fluid, cylinder size and fluid speed, provided that the flow has a Reynolds number in the range ~40 to ~1000. In fluid mechanics and transport phenomena, an eddy is not a property of the fluid, but a violent swirling motion caused by the position and direction of turbulent flow. In 1883, scientist Osborne Reynolds conducted a fluid dynamics experiment involving water and dye, where he adjusted the velocities of the fluids and observed the transition from laminar to turbulent flow, characterized by the formation of eddies and vortices. Turbulent flow is defined as the flow in which the system's inertial forces are dominant over the viscous forces. This phenomenon is described by Reynolds number, a unit-less number used to determine when turbulent flow will occur. Conceptually, the Reynolds number is the ratio between inertial forces and viscous forces. Reynolds Experiment (1883). 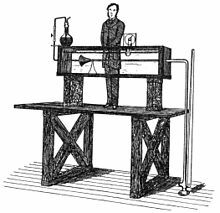 Osborne Reynolds standing beside his apparatus. Hemodynamics is the study of blood flow in the circulatory system. Blood flow in straight sections of the arterial tree are typically laminar (high, directed wall stress), but branches and curvatures in the system cause turbulent flow. Turbulent flow in the arterial tree can cause a number of concerning effects, including atherosclerotic lesions, postsurgical neointimal hyperplasia, in-stent restenosis, vein bypass graft failure, transplant vasculopathy, and aortic valve calcification. Comparison of air flow around a smooth golf ball versus a dimpled golf ball. Lift and drag properties of golf balls are customized by the manipulation of dimples along the surface of the ball, allowing for the golf ball to travel further and faster in the air. The data from turbulent-flow phenomena has been used to model different transitions in fluid flow regimes, which are used to thoroughly mix fluids and increase reaction rates within industrial processes. Oceanic and atmospheric currents transfer particles, debris, and organisms all across the globe. While the transport of organisms, such as phytoplankton, are essential for the preservation of ecosystems, oil and other pollutants are also mixed in the current flow and can carry pollution far from its origin. Eddy formations circulate trash and other pollutants into concentrated areas which researchers are tracking to improve clean-up and pollution prevention. Mesoscale ocean eddies play crucial roles in transferring heat poleward, as well as maintaining heat gradients at different depths. Eddies that are between about 10 and 500 km (6.2 and 310.7 miles) in diameter and persist for periods of days to months are known in oceanography as mesoscale eddies. Mesoscale eddies can be split into two categories: static eddies, caused by flow around an obstacle (see animation), and transient eddies, caused by baroclinic instability. Mesoscale ocean eddies are characterized by currents that flow in a roughly circular motion around the center of the eddy. The sense of rotation of these currents may either be cyclonic or anticyclonic (such as Haida Eddies). Oceanic eddies are also usually made of water masses that are different from those outside the eddy. That is, the water within an eddy usually has different temperature and salinity characteristics to the water outside the eddy. There is a direct link between the water mass properties of an eddy and its rotation. Warm eddies rotate anti-cyclonically, while cold eddies rotate cyclonically. Modons, or dipole eddy pairs. ^ a b Chiu, Jeng-Jiann; Chien, Shu (2011-01-01). "Effects of Disturbed Flow on Vascular Endothelium: Pathophysiological Basis and Clinical Perspectives". Physiological Reviews. 91 (1): 327–387. doi:10.1152/physrev.00047.2009. ISSN 0031-9333. PMC 3844671. PMID 21248169. ^ Lightfoot, R. Byron Bird ; Warren E. Stewart ; Edwin N. (2002). Transport phenomena (2. ed.). New York, NY [u.a. ]: Wiley. ISBN 0-471-41077-2. 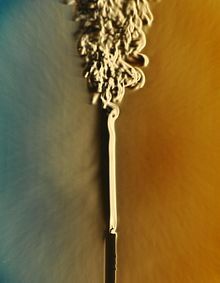 ^ Kambe, Tsutomu (2007). Elementary Fluid Mechanics. World Scientific Publishing Co. Pte. Ltd. p. 240. ISBN 978-981-256-416-0. ^ "Pressure". hyperphysics.phy-astr.gsu.edu. Retrieved 2017-02-12. ^ Arnold, Douglas. "The Flight of a Golf Ball" (PDF). ^ "Why are Golf Balls Dimpled?". math.ucr.edu. Retrieved 2017-02-12. ^ Dimotakis, Paul. "The Mixing Transition in Turbulent Flows" (PDF). California Institute of Technology Information Tech Services. ^ "Ocean currents push phytoplankton, and pollution, around the globe faster than thought". Science Daily. 16 April 2016. Retrieved 2017-02-12. ^ "Ocean Pollution". National Oceanic and Atmospheric Administration. ^ "Ocean Mesoscale Eddies – Geophysical Fluid Dynamics Laboratory". www.gfdl.noaa.gov. Retrieved 2017-02-12. ^ "Linear eddy viscosity models -- CFD-Wiki, the free CFD reference". www.cfd-online.com. Retrieved 2017-02-12.